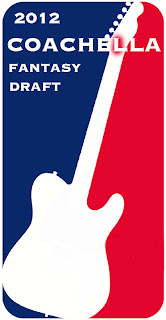 First of all, if you haven't checked out Mike's recap of our 2012 Fantasy Draft for Coachella, make sure and do so NOW! Ok, now that you are up to speed, he's back with Part 2 - covering the results of our Fantasy Draft, as well as some helpful hints on actually getting to Indio for you first timers out there. Check the details after the jump, and don't forget to check out friends of OSTT - Past the Bar! Each year thousands of music fans make the annual hajj or pilgrimage to the music mecca that is Coachella. Unfortunately, just like the real Mecca, Coachella is in a valley in the middle of the desert. The Coachella Festival is held annually at the Empire Polo Club Grounds in Indio, California. The official website of the City of Indio uses the motto, "The Place To Be." I totally agree if it's the week of Coachella or Stagecoach (Coachella's country music alternative), or if you are a gilla monster. No one wants to pull a Moses and wander around out there too long, though talk about patience and faith…I would've followed him around for an hour…maybe two…then be like, screw this…I'm out…I'll figure it out myself…plus my phone has GPS now, so thanks anyway Moses, I'll just ask Siri. So unless you live in the Indio desert area (and really, you guys have internet and electricity out there? How are you reading this? Just kidding), then you're going to have to get out there somehow. You could fly directly into Palm Springs. But who do you think you are Richard Branson? And if you have a private plane, you probably don't need advice from me, you've got things handled pretty well….also…let me know, because drinks are on you….awesome. Most people will take some route that leads them to LA and then drive over from there (with the exception being those trekking West from Phoenix or Vegas or North from San Diego). The drive from Los Angeles to Indio is about a two hour drive…………with no traffic. So if you're an LA native, have ever visited LA, have every seen a movie about LA, or have heard of this mythical place that is LA…you know that the drive could be anywhere from two hours to ten. Be prepared….but at the same time realize that unless you have some magic teleporter or Xzibit and Marty McFly have been working on your personal DeLorean….no matter how smart you think your travel plan is, other people will have the same idea and be on the road. Put together a Coachella playlist to get hyped up, or go the opposite direction and listen to nothing resembling the Coachella lineup to cleanse the palate…its gonna take a while…enjoy the ride. Most people generally either go up Thursday or early Friday morning. This will likely be dictated by your work schedule and accommodations, but it is definitely advisable to head out there sooner rather than later…and I highly advise getting out there at some point on Thursday, even if that means paying for an extra night wherever you're staying. I've tried driving up the day of twice, once for Coachella and once for Stagecoach, and it was as enjoyable as about five hours of phone tech support while being hit with a whip with a full body sunburn. If you're lucky traffic will start to clog up around Palm Springs, and that's if you're lucky. The lines of cars trying to get to the grounds after getting off the freeway is a whole other story. Ya…that 89 year-old lady with the walker who just passed your car definitely did the Usain Bolt point celebration after flying by your car on the sidewalk. But the worst part is sitting in the traffic, not knowing when you will actually make it, watching the clock slowly tick away as you cross artists that you've missed off of the list. Be safe, leave Thursday or early early early early Friday morning. Most people leave Thursday night after the workday is over. 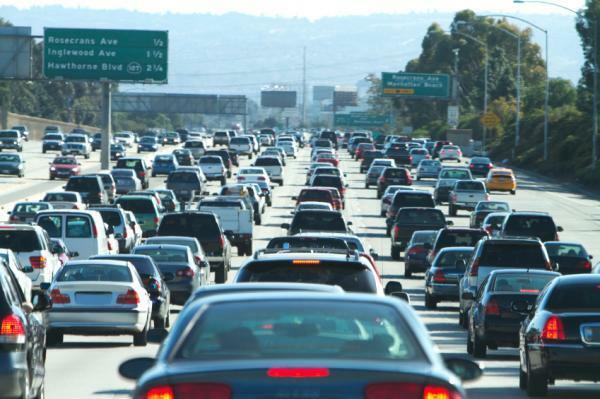 You can leave after work and be stuck in Thursday LA rush hour traffic, not a good look. Or wait till later in the night, which everyone else heading to Coachella has waited for, and so there's still some traffic, but it's not quite as bad, and you can play guess which car on the road is also headed to Coachella (hint: it's the ones full of hipsterish looking people and/or one's with Coachella written all over the car). and gave her a ride to her friends' camping site at the festival. Sure, there were some awkward moments along the way, riding with a complete stranger, but then again that happens with anything I do anyway. 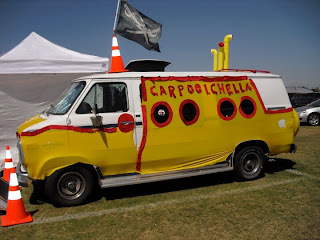 So it all worked out, and if you are in need of a ride, or like the idea of carpooling to be more environmentally friendly, or just want to live the Coachella experience, it's worth looking into. Correct - AK - 0, HS - 7 (A$AP Rocky, The Weeknd, Bon Iver, David Guetta, Santogold, Azaelia Banks, Frank Ocean), JH - 4 (Kendrick Lamar, Calvin Harris, Nero, Beirut), ML - 12** (Radiohead, Childish Gambino, The Black Keys, The Shins, Swedish House Mafia, M83, Justice, Fiest, Florence and the Machine, Fluxx Pavilion, SBTRKT, AVICII). Thank you, thank you, thank you...you're far too kind! (*Jay Z Voice). Considering none of us had any idea who would be there, each taking 34 guesses, we didn't do too bad (except AJK haha), nailing 23 of the acts performing at the festival. In fairness, I had a bit of a competitive advantage having gone the last three years and having a general feel for the type of people who play the festival...though I'm not really sure that necessarily helped me that much. Because of my history, I was hesitant to pick The Black Keys and Florence + the Machine having seen them both there in previous years....but I went against the idea that Coachella organizers do no like repeat performers since The Black Keys have a new album out, and since I saw Florence on a really small daytime stage and her popularity has increased a lot since then. My other advantage was that a listen to a bit more djs than the rest of the crew...so it was easier for me to throw a few of those names out there. I like to think I have a pretty diverse mix of music on my iPod, and get my music from a lot of different sources, over multiple genres...so that definitely helps (knowing who has new albums coming out before the festival, etc. )...though my friends certainly know their music and are open minded as well and I definitely trust and am enlightened by their musical tastes...so in some areas I may have a bit more knowledge, but in others they have me beat...so it was actually pretty even. Like I said in the original Fantasy Coachella Draft post....it was really just about getting together for a good time...so really...we all won....though........I'll certainly enjoy my free drinks for being our first Coachella Draft Champ! Up next will be our Coachella Listening Party, so stay tuned!